Many films in recent time depict the violent collision of man and nature (as if we ever were truly at odds with it in the first place). The Grey, in many ways, rather than simply offering an action packed narrative, tries desperately to use this cold struggle as a discussion on the inevitability of death and the various ways contemporary men deal with it. I say “men” and literally meaning male, because the only death we see of a woman is in such striking contrast to what the males face. This ”dealing” is stretched over two hours of claustrophobia in the most open of wilderness. 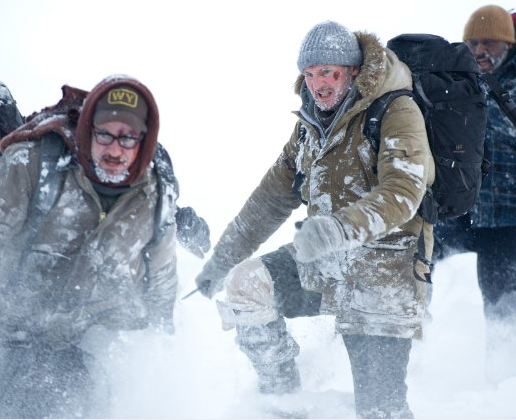 The story centers on a broken anti-hero, ready for suicide, named Ottman (Liam Neeson), who awakes to the bloody aftermath of a plane crash in the frozen wilderness of Alaska. His companions are a collection of oil-rig ruffians who fill all the prototypical clichéd roles we often see in fellowship movies on a quest. In this case, the quest is survival. It does not take long for these men to realize that the cold, desolation, and the prospect of never being found is not their greatest enemy, it is the indigenous grey wolves (which at times are unsuccessfully depicted by CG and have moments of looking quite fake). And thus begins a sort of Jets-versus-Sharks movie, only one of the gangs didn’t just barely survive, hitting the tundra at 400 miles an hour without food or guns or any other truly worthwhile survival supplies. Not to mention it was on the turf of a gang of dogs the size of men (still difficult to truly imagine), who are also, in nearly every way, physically superior to man, especially in this environment. The writing is definitely on the wall quite early on and the foreshadowing doesn’t disappoint, doesn’t deliver a miracle, nor provide a respite from the existential uneasiness the film conveys. The Grey definitely provides reasons to go out of your way to watch it, not the least of which is Liam Neeson. He once again shows his subtlety in character development and never overdoes it. Always powerful, he often takes a back seat to watch the heat and flash of the other characters, which gives them space to develop in a very short amount of time. With occasional lapses in script quality, mainly due to believability, Neeson ushers forth the text with a gravitas that few of his contemporaries could muster. On equal footing with Neeson’s acting is The Grey’s treatment of sound design and its cinematic depiction of the cold northern territories. It engages you in unique, beautiful ways and one is struck in particular by the moments of silence. They happen at the right time and bring with it both horror and a haunting certainty that for once humanity’s hubris holds no sway. One gets the feeling that this silence was to be a supportive beam in the architecture of the narrative, and it was indeed successful. The Grey is not for everyone, but not just because of its vulgarity, violence, and intense situations. In one corner will be moviegoers who see the addition of philosophical ideas in what should be a simple survival movie as tiresome and pedantic. How dare we go to the movies to think! In the other corner will be those who find these philosophical ideas intriguing, but are surprised by the fact that redemption is mysteriously absent and will grow confused and disillusioned by the sequence of events that befall the seven survivors. It asks questions but delivers no answers, and thank goodness. It is sometimes a strange joy to see a movie that brings with it terrible quiet, horrific beauty, and the truth that humans are still fragile. I thought 'The Grey' was well worth the rental price. The plane crash sequence was done wonderfully and I found myself actually 'feeling' it. For what it was, it was acted well, and the meaning behind the movie was great. My only 'glitch' with the movie is that I believe someone should have survived. Didn't have to be Neeson or anyone in particular, just someone. Also, I don't think it would have been too difficult to have constructed some types of better weapons from plane parts, to fend off the wolves. They all had knives. What happened to knives on sticks for spears? To those seeing the movie as unrealistic, you must look beyond the surface of the film. The grey wolves are a metaphor for the main characters depression over uncontrollable parts of nature; and his own search for the meaning of life. The wolves represent Neeson’s own demons, which he begins to kill off at the beginning of the movie. He is depressed over the death of his wife (uncontrollable nature-the wolves- natures attackers-taking from you what you love). He also tries to kill the wolf (uncontrollable parts of nature-fatal disease) eating a hurt women (his wife), yet the wolf prevails (his wife doesn’t defeat death). The wolves in the movie are unrealistic, as are some of the other scenes such as swinging off the cliff, because they are symbols of his psychological state. His character is trying to leap and come out of his dark place and back to a healthy state of mind. Neeson’s character is trying to live and make sense of his current reality. He chooses to leave his misery (plane site) to make it to a place where he thinks he can possibly escape this dim state of mind and live on. He realizes if he stays in this shadowy place of his psyche all is lost and he'll never be found (i.e.-cold wilderness environment of the plane crash). If he stays, he'll continue to be surrounded by the grey (depression). All of the other surviving characters are parts of himself in his (grey) depressed mind while he is contemplating suicide. He searches and realizes no one will or can rescue him but himself. In the end, Neeson leaves the worn out man (the part of himself wanting to give up) and decides to fight on as he sees a glimmer of light at the end of the tunnel ; as stated and encouraged in his father's poem. His father also battled alcoholism and depression which Neeson witnessed as a child. His father may have written this poem in his own grip of depression. Neeson uses that poem as inspiration in deciding to fight for his own life, while at the edge of it, with whatever he has around (which is his own psychological strength). The scene after the credits shows the wolf subdued and still breathing. Which means Neeson (the same) is still alive, yet hasn't completely killed and shed his grey depressed feelings. What a great and refreshing film! Exciting, entertaining, real, thought provoking, and well acted! Worth the time to see!